Native Americans believe the night air is filled with dreams, both good and bad. To protect the sleeping individual from bad dreams, they construct a hoop - the symbol of strength and unity - from willow, and adorn it with feathers, beads and other bits and pieces of everyday life. Then it is hung over or near the bed to catch dreams as they flow by. Good dreams pass through outer holes and glide down the feathers to the sleeping person below. Bad dreams, not knowing the way, get tangled in the dream catcher and perish with the first light of day. Meticulously crafted with tightly wrapped black cord, this stunning Dream Catcher features a hand-stretched leather centerpiece that depicts with breathtaking realism a scene from American Indian life. Wooden beads and natural downy feathers cascade from real leather cords, perfect for filtering good dreams to waiting sleepers. Because this Dream Catcher is made by hand with natural components, no 2 will be exactly alike. You'll want to put your Dream Catcher to work immediately so we include a hanging nail that is ideal for ceilings, walls or wooden window casings. You'll also receive a descriptive card that explains the significance of the Dream Catcher and its artistic rendering. We confidently offer a 30 Day Money Back Guarantee to ensure your satisfaction. Follow your dreams to your hidden potential. Add Imprints Plus 24" x 42" Dream Catcher Wall Hanging to your cart today. 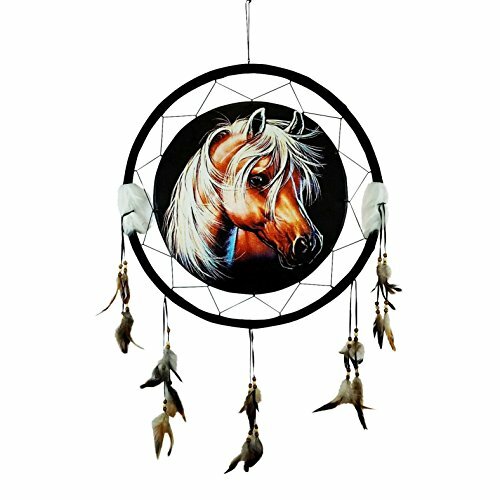 HORSE HEAD Dream Catcher boasts tightly wrapped black cord, beads and natural feathers. Includes hanging nail and descriptive card detailing the spiritual significance of dream catchers. 24" DIAMETER DREAM CATCHER with wooden beads dangling from real leather cords measures approx. 42" in length. This distinctive symbol of strength is a lovely addition to the interior decor your home. POWERFUL IMAGERY is captured in full color and detail on a leather centerpiece that is then hand-laced into the center of the Dream Catcher. This gives each Dream Catcher its' own unique character. LIGHTWEIGHT AND VERSATILE for easy hanging from a wall, ceiling or window frame. Native Americans believe that, when hung near a bed, good dreams glide down the Dream Catcher's feathers to the sleeper below. ONE-OF-A-KIND GIFT IDEA for any kindred spirit. Because each Dream Catcher is made by hand with natural components, no 2 will be exactly alike. Bestow a lifetime of sweet dreams on your loved one. If you have any questions about this product by Imprints Plus, contact us by completing and submitting the form below. If you are looking for a specif part number, please include it with your message.